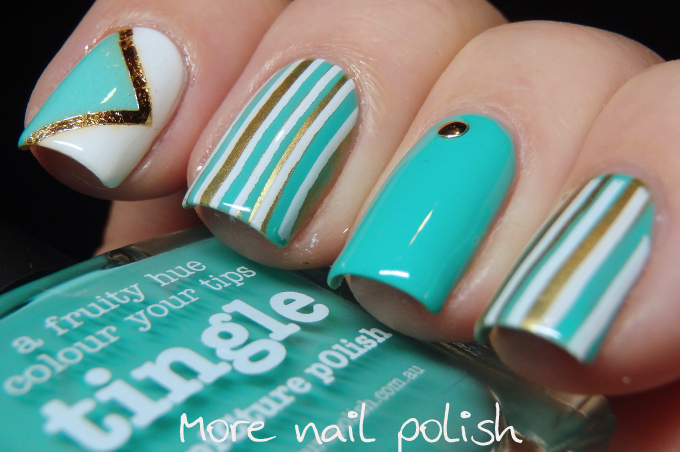 Picture Polish Tingle is one of the newest creme shades released by Picture Polish. Don't you just love a good creme polish? This design just came together as I was applying it. On my index finger I actually applied a temporary tattoo from Snap Tats. I chose it because the shade of aqua in the design is almost identical to the shade of tingle. But I'm not such a fan of the fact the the gold in the temporary tattoos bleeds when you apply top coat. You have to be very careful to float the top coat on and not wipe the same spot twice. On my middle finger and thumb I did double stamping using two different straight line stamping images. To my absolute amazement, I managed to line up the lines on my middle finger pretty perfectly so that it looks like the gold lines are exactly aligned with the white ones. I didn't manage so perfectly on my pinky, but you may not have noticed if I didn't say something. Now some swatches of Tingle on it's own. Tingle is the same tone as Chillax, but they are not dupes, Tingle is darker. This is two coats of Tingle with Picture Polish Gloss on Top top coat. Picture Polish Tingle is available from Picture Polish. International ladies may be able purchase through one of the many Network stockists if they have this in stock. I can't believe you stamped those lines - they look perfect!